A team of French and Italian astronomers have devised a new method for measuring the size and shape of asteroids that are too small or too far away for traditional techniques, increasing the number of asteroids that can be measured by a factor of several hundred. This method takes advantage of the unique capabilities of ESO's Very Large Telescope Interferometer (VLTI). 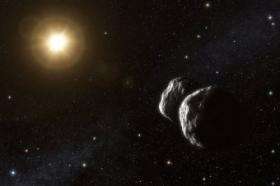 "Knowledge of the sizes and shapes of asteroids is crucial to understanding how, in the early days of our Solar System, dust and pebbles collected together to form larger bodies and how collisions and re-accumulation have since modified them," says Marco Delbo from the Observatoire de la Côte d'Azur, France, who led the study. The interferometric technique combines the light from two or more telescopes. Astronomers proved their method using ESO's VLTI, combining the light of two of the VLT's 8.2-metre Unit Telescopes. "This is equivalent to having vision as sharp as that of a telescope with a diameter equal to the separation between the two VLT Unit Telescopes used, in this case, 47 metres," says co-author Sebastiano Ligori, from INAF-Torino, Italy. The researchers applied their technique to the main belt asteroid (234) Barbara, which was earlier found, by co-author Alberto Cellino, to have rather unusual properties. Although it is so far away, the VLTI observations also revealed that this object has a peculiar shape. The best fit model is composed of two bodies each the size of a major city - with diameters of 37 and 21 km - separated by at least 24 km. "The two parts appear to overlap," says Delbo, "so the object could be shaped like a gigantic peanut or, it could be two separate bodies orbiting each other." If Barbara proves to be a double asteroid, this is even more significant: by combining the diameter measurements with the parameters of the orbits, astronomers can then compute the density of these objects. "Barbara is clearly a high priority target for further observations," concludes Ligori. These observations are presented in a paper by Delbo M. et al., First VLTI-MIDI direct determinations of asteroid sizes, in press in the Astrophysical Journal. They didn't prove the validity of their new technique as claimed because they didn't apply it to an asteroid whose size and shape is already known.